Rosetta Tarot in full size is back, reincarnated with the Papyrus GOLD edition. This numbered edition of only 220 copies has retained the original art but updated the borders with the look of authentic papyrus, with GOLD FOIL borders around the art and the card titles hand written in Egyptian hieroglyphs. 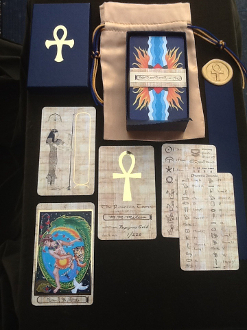 Comes with a matching satin bag, an authentic papyrus deck wrap (not shown), a satin and wax seal box wrap (not shown), a hieroglyphic key card guide for translation, and a customizable significator card for your name, plus a card signed and numbered by the artist. For a limited time artist will cusomize your first significator upon request (subject to discontinue at any time) or you can do for fun with the included guide. Shipping first name will be used if none provided. Optional second significator can be added. Pdf instructions on reading and writing the hieroglyphs and Pdf "little white book" free. Hieroglyph pdf guide link with purchase; little white book pdf upon request.